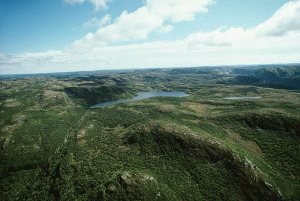 Western Newfoundland runs from Port aux Basques to the top of the Great Northern Peninsula. Gros Morne National Park is a UNESCO World Heritage Site, offers camping and mountain hiking, and gives views of old growth forests, coastal lowlands, and the spectacular mountains and fjords carved by glaciers. A National Historic Site at Port au Choix explores ancient history including, at L'Anse aux Meadows, the grassy field where the Vikings first settled the New World - five centuries before Columbus. The French Shore is located on the northern half of the west coast where, for more than 300 years, French fishermen kept a distinct culture. The Stephenville Festival provides entertainment of many sorts. The Humber River is a well known salmon fishing area. Nearby Deer Lake has one of the best sandy beaches in Newfoundland, with a park and scenic hiking trail. The Insectarium and Butterfly Pavilion display many species of butterflies, honey bees, and creepy crawlies. For wintertime entertainment, Marble Mountain is reputed to have the best downhill skiing east of the Rocky Mountains. Corner Brook, with its Captain James Cook Monument, is a key point from which to start your expeditions of Western Newfoundland. Hotel Port aux Basques Hotel Channel - Port aux Basques 1 Grand Bay Rd.